This summer M&I spent a few weekends in our little 10×10 country retreat, although in my current condition, my time was mostly spent at the pool which left M to toil away on projects. I say toil, but he loves to get his hands dirty so it is isn’t exactly a hardship for him. We have things set up so that it is quite comfortable to spend the weekend. We have a few pieces like a mini fridge that were handed down to us and we have talked about painting it but haven’t gotten around to yet. This great project by Apartment Therapy reader Sarah has me inspired to finally get the job done. So simple and inexpensive but what a difference! 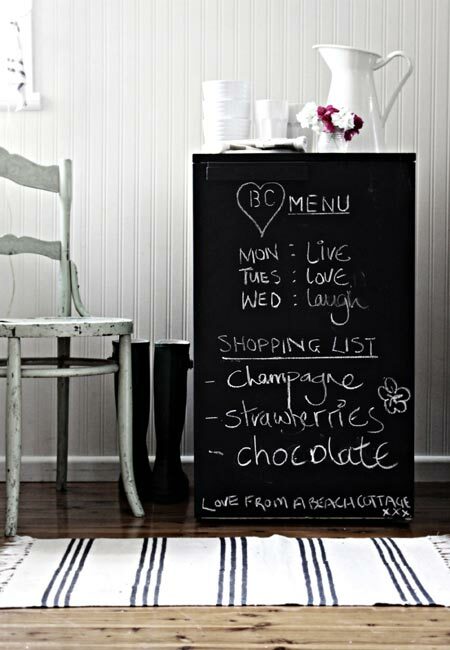 I love chalkboard paint and what a great way to write little notes and reminders to ourselves without having to scrounge around for paper. Soon it will be a little too chilly to stay in the cabin so this project may have to wait until next season.